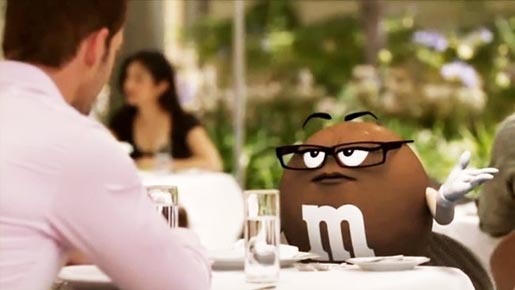 M&M’S is rolling out “One Track Mind”, its newest TV ad featuring Ms. Brown, who made her television debut in February at the 2012 Super Bowl. The spot features William Levy, the Cuban heartthrob from the recent season of Dancing with the Stars, in a lunch side chat with the Chief Chocolate Officer. The One Track Mind ad was developed at BBDO New York by chief creative officer David Lubars, executive creative director/copywriter Lauren Connolly, executive creative director/art director Tim Bayne, associate creative director/copywriter Paul Bartow, executive producer Bob Emerson, producer Chris Lenz, music producer Melissa Chester. Filming was shot by director Bennett Miller via Smuggler. Editor was Maury Loeb at PS 260. Visual effects were produced at Laika/House by creative director Kirk Kelley.